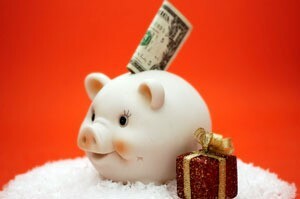 One way to prevent Christmas from being a financial burden is to plan ahead. Here are some tips from the ThriftyFun community to help you save money on Christmas by planning ahead. I have saved so much time and money! Instead of waiting for holidays, I buy gifts whenever I see what I think a friend or relative will enjoy. I place the gifts in boxes and mark the outside of the box and just keep adding all year round. When birthdays and holidays roll around, I am always prepared. My budget is intact! How about not buying gifts for folks? Christmas isn't about buying stuff anyway. When we do buy gifts, it's for the kids. We put $30 in a separate account per month for the kid's birthdays and Christmas. It's part of our budget. I put back $50.00 to $100.00 a month into my savings account so that when Christmas rolls around I will have money. I have done this every year for the past 8 years and it seems to be doing really well. It also draws interest too. When you receive gifts that are wrapped, keep the pretty paper and run it through your paper shredder. You can use this festive fluff when shipping long distance gifts or use to fill gift bags (which we all recycle, right?) It's just a little thing, but it is something. Instead of buying gifts for everyone in your extended family, draw names so each person buys for only one and then set a dollar limit. You could even limit it to the children in the family. We do this and set a limit of $25 for each child. This year the adults are not buying gifts for each other, we are only buying gifts for the kids. Also, when we did buy gifts we would give a list of ideas of gifts we would want. Therefore, no standing in return lines the day after Christmas, everyone got what they wanted! We have not returned any Christmas gifts since around 1982. Amazon.com has wish lists. It is free to get an account, and the wish list shows the multiple gift buyers if a gift has been bought or not, so you don't give the person duplicate gifts. When you buy a gift, go to the recipient's account and check it as "bought". By default, Amazon does not show the recipient if the gift has been purchased but they can view that field if they want. Also, the recipient can update their list all year round as they change their mind, and the list has a priority for each gift. So people can buy the gift they can afford, and the one the person wants the most from the list. You can also try making a small gift. Try making origami bowls. They are relatively simple to make and look nice if made out of wrapping paper or colored paper. They can hold candy or other light items. When buying gifts for children, remember they go through all kinds of stages. I've made the mistake of buying the wrong toys at the wrong times just because they had dirt low prices on them and I had fond memories of the toys and games myself. Children grow and as each year passes they can never be brought back! If they're not ready for the Lite Brite, then get them the Twister! Get them what they will be excited to have in their stage of life! There's nothing worse than seeing it sit in the closet or get torn apart and pieces lost before they grow into wanting to use and play with it. Let them enjoy the items they're into at the time. Otherwise it is spending money years sooner, sometimes, than needs to be. And that is a waste of money! My next door neighbor and I are going to swap any unwanted decorations with each other. The decorations will be new to the other person and it will save us going out and buying something new just because we are tired of our old stuff. Food/Gift Baskets: Some years when I haven't either the extra money for baskets, or the time to go to the thrift store to find one, I cover a suitable sized box with wrapping paper. I have used anything from a small check box to the larger, tray-type boxes that canned goods come in (like at Aldi's). Make sure you cover the inside, too. Also, for filler, I have used white poly-fill - found in the craft department, it's intended use is for stuffed animals or pillows. It looks like snow, takes up quite a bit of room, cushions the baked goods, and is quite thrifty! One bag goes a long way. I always start my shopping the day after Christmas. I hit clearance sales all year round or just what ever I think would tickle someone's fancy as I see them. By Christmas all I have left to buy are the "in" toys for my children and it doesn't seem like I've spent so much! I started saving for Christmas with my first paycheck of the year by purchasing a gift card. Every two weeks I have been adding $20 to the card. This will work out great because I can do my shopping before December 24th and I will have a debt free Christmas! Check the fine print on the gift cards. I had one that I did not use right away and found out that they deducted from the card if it is not used with in a certain time. Sorta like the Mission Impossible tape that self destructs. I think it's great that you're getting a jump on Christmas, but read the "fine" print with the gift cards. If they are not used within a specified period of time, they may charge a non-use fee that can end up being pretty hefty. If you do like homeschoolin_mum and hit clearance sales (our Wal-Mart runs a clearance isle all year long) that will keep your card up to date and you'll be saving money, too! Keep up the thrifty shopping. Drawing names for a gift exchange can backfire and end up costing more than people can afford or should spend. We had our shopping done. Or, so we thought. We then received an email that my husband's side of the family was doing a gift exchange. It included the names of two people (one for each of us) that we were assigned to buy gifts for. It even said the cost of the gift was to be between $25 - $30 for each person. Ouch! That's another $50 to $60, plus shipping (we live out of state) that we didn't plan to spend. I have 4 (grand) girls to buy for: 18, 16, 12, and 8. I went to Dollar Tree and found this for each at a cost of $4.25 each or $17.00 total for 4. That's a nice fun gift for each @ $4.25. I also will make those "chocolate spoons" with stuff I already have at home. You could even personalize the stocking if you want to make it really special. Save your cards! Cut out some or many designs from the card (providing there is no writing on that side of the card!) and use them for labels. My extended family drew names for years. It works very well, but you should get on it early in the year. We drew for the names at Thanksgiving - that is, here in Canada, the second Monday in October. That way there was lots of lead time to plan the gift. I have also experienced this in my boyfriend's fairly small family (6 adults). It was very nice to be included for the occasion, and took the pressure off, when one didn't know exactly how the gifting was done in his family.